Does the Chamber of Commerce know something we don’t know? Actually, compared to most locations in Washington, we’ve got it pretty good. 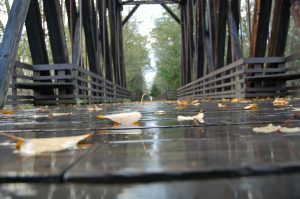 Our average rainfall is less than 20″ a year, temperatures are quite mild and we do indeed get a lot of sunshine. (A LOT in the summer, and bits and pieces of sunshine nearly every day during the rest of the year.) Clean, fresh air coming in off the Pacific Ocean keeps the ugly weather from hanging over our heads for days at a time. Sequim is a great place to enjoy the outdoors. 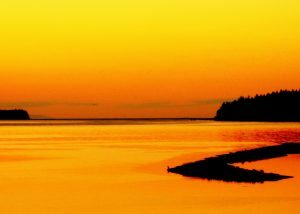 Approximately 6 miles north of town are the Straits of Juan de Fuca and many public beaches. Go south a couple of miles and run into state lands and access trailheads into the Olympic National Park. Mark loves to go waterskiing on Lake Crescent in the Olympic National Park, and Beth enjoys hiking in the foothills or on the local beaches. Sequim also has three golf courses, the private course at SunLand and two public courses; The Cedars at Dungeness and Skyridge. If you enjoy boating, check out the John Wayne Marina. And pilots can take advantage of our local airport and a multitude of private strips. Our proximity to urban areas is also a plus! 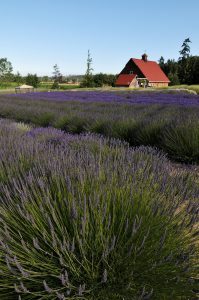 Sequim’s a little over an hour’s drive from the Seattle ferries. The best thing to do is leave your car in Bainbridge and walk or take the public transit to the downtown sights like Pioneer Square and Pike Place Market. Sequim’s also just a short distance from Victoria, B.C. Canada. Take the Coho Ferry from Port Angeles and enjoy tea at the Empress Hotel, tour the Parliament buildings and check out the Provincial Museum! Check out the Sequim Chamber of Commerce’s website for lots of additional information about Sequim! We think you’ll agree it has a lot to offer! I’ll begin with late summer, September. This is one of the driest months of the summer, the days are getting shorter and it cools off overnight, but what fantastic days. Warmish, but not too warm, and that late summer laziness that seems to imbue everything! When we are lucky, October can also be very nice, starting to get cooler, a bit more rain, but still quite pleasant. November continues in much the same vein, but we often have our first real cold snap of the winter at the end of the month. We may see the first sizable snow in the mountains, rain in the valley, and the combination of these with some warmer nights inducing snow melts will raise the level of the local rivers and streams for the first time since the spring before. Winter begins in earnest in the first half of December. Winter by Sequim standards means gray days and light rain. The great thing about this type of weather as compared to the Seattle version is that our winter fronts are always moving, systems DO NOT hang over our heads for days like they do in the Puget Sound area, thank goodness. So even if we’re having a cloudy and rainy day, we almost always have a little break where the sun can peek through, and believe me that makes all the difference in the world. If we do get snow, it will usually arrive a few days after Christmas or sometime in January or occasionally very near spring. Generally, it’s not much, an inch or two and it rarely sticks more than a few days. We did get quite a lot of snow that El Nino year, the winter 1996/1997. But that’s been the worst snow anyone here remembers in their lifetime. The mountains will have a healthy bit of snow by now, where it will stay until early summer. Temperatures over the winter months will be in the high 30’s – 40’s during the day with heavy overnight frosts maybe 15-20 nights over the course of the season. In gardener’s terms, we’re VERY mild, I leave my dahlias and gladiolus in the ground (as long as the soil drains, they’re okay) and artichokes and other tender perennials will winter over without any special attention. During the winter we will often have a week in February and a couple of weeks in March, where the temperature comes up, things dry out and it’s quite pleasant to work outside in the yard/garden. By late March and early April, there are signs of spring. Weather continues to be a bit unsettled, with showers interspersed with bright days. May is a terrific spring month in Sequim. We have our Irrigation Festival over Mother’s Day weekend, and there have been times when it’s been downright hot, 70 degrees+. This continues to be interspersed with rain showers, which is excellent for the garden. After this great build-up, which gives everyone spring fever, June arrives to remind us that it’s NOT summer yet. The funny thing is that every year, people complain about June, they seem to forget that it happens nearly EVERY year! Not bad, certainly, but quite changeable. Summer arrives on July 5th! The valley has already dried out considerably by this time (the showers we had in June are not enough to soak the soil very deeply) and those of us in our gardens are watering every day. Throughout the summer, we will have fantastic, nearly cloudless days. No rain for days on end and temperature ranging from the high 60’s into the 80’s on rare days. Afternoon breezes off the Strait keep us cooler during this time of the year. We have daylight during the summer months until 9:30 at night, which is wonderful! The sun can be quite intense if you have many south-facing windows in your home, and you would be wise to keep these heavily shaded until the afternoon. So that brings us back to where I started.